Written on 29 January 2017. Our one-year intensive MBA is rated 3rd in world on the “Value for Money” criterion for two years running. 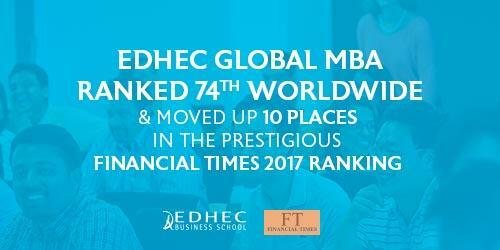 EDHEC Business School is delighted to announce that the Financial Times has ranked EDHEC Global MBA 74th in the prestigious top 100 MBAs worldwide, moving up 10 places from last year. This result confirms the rapid progress of the School in most recent international rankings. Indeed, EDHEC recently joined the Financial Times’ Top 15 European Business Schools, achieving the most impressive gain in the rankings. EDHEC Global MBA is ranked 3rd worldwide on the “Value for Money” criterion for two years running (and 1st in France). This excellent result is due to its one-year format and the strong career and salary progression of our alumni. The programme distinguishes itself through a cutting edge curriculum, which is continually evolving in alignment with the needs of business leaders. For example, EDHEC Global MBA provides Criminal Risk and Cybercrime courses, Big Data & Artificial Intelligence @ Work courses in conjunction with corporate partners such as Google and Amadeus and Operations and Supply Chain with Amazon. The programme offers immersion in diversity with over 90% international students (39 nationalities), business trips across four continents (Africa, Europe, Asia and North America) and a large representation of women (42%). Our personalized Career Coaching also maximizes the impact of a one year programme. In October 2016, The Economist ranked EDHEC Global MBA among the Top 25 MBAs worldwide (moving up 10 places from 2015) and 7th in Europe. « This ranking reflects the outstanding dynamic achieved by EDHEC Business School, showing strong performance in most rankings over the last months, explains Olivier Oger, Dean of EDHEC Business School. We are very proud of this result, which illustrates our international recognition, our growing impact on business and more broadly the success of our strategy”.